As a DJ, I think of myself as a kind of audio ferryman, moving my audience from one track to another as smoothly as possible. Although my passengers are more likely to be interested in their destination, I am more interested in the transitions from one track to the next. Sometimes when I re-listen to my own mixes I skip over the “song” parts, looking just for the transitions. I have sentimental attachments to these transitions and take great pride in the ones that sound more effortless than they actually were to create. In my best transitions, one track subtly emerges from the background, in step with the foreground track and continues to grow, ultimately taking the lead role. The formerly dominant track sends off the new one, fading out with the same grace that it had entering the mix. For a while though, the two tracks play simultaneously, crafting a piece of music that, while reminiscent of both tracks, is also something entirely different. In the same way that my DJing style represents my authorial voice, video game designers use transitions between times of day in their games as one way of showing theirs. Evenings and mornings are the periods where “mixing” occurs, but there are many different ways for games to handle these transitions. Even though I’m not the DJ in gaming situations, I recognize a similar craft in day/night cycles. Two recent games, Miasmata and Proteus, closely reflect the mixing style that I try to achieve as a DJ, but adapted to a game context. They do this by drawing out smooth, organic transitions that prompt you to play the game differently during evenings and mornings than during day or night. I’m attracted to these times of transition, not because they have the most impact on the game, but because they show what kinds of DJs the games’ developers are. Miasmata and Proteus use day/night transitions to change how they are played, and implement these transitions in ways that parallel my smooth and subtle approach to DJ mixing. Mornings and evenings in both games are rich, effective transitions, but I’m going to focus specifically on evenings because they have a more distinct application in these two games. In both, the evening hours require an awareness of the sun’s position to gauge how much time you have before night falls. Evening hints at the night in a way that builds anticipation, much the way that a DJ transition can make listeners eager for a climactic bass drop or recognizable hook. Although evening is a much shorter time span than either day or night, these compact, transitional periods mix elements from the light and dark hours and generate atmospheres that are unique. Miasmata and Proteus’ evenings are slick, robust transitions, paced with meted precision. I can only hope that my DJ mixes are remotely as polished as these day/night fades. Miasmata’s evening transition initially occurs subtly, which is part of why it’s so dangerous. It’s like listening to a DJ mix where you’re so wrapped up in the current song that you don’t realize another track is being mixed in, except in Miasmata, the incoming track is an impenetrably dark night hiding a vicious panther-beast. Miasmata is a first-person survival game, and as such, an acute awareness of your location and time of day is key to staying alive. Plague-ridden and stranded on a deserted island with a creature stalking you, you must synthesize a cure for your disease using native flora and the abandoned scientific research facilities scattered around the landscape. You spend the majority of your time surveying the island’s terrain for landmarks shown on your map so you can discover where you are. The island is full of deep forests and steep cliffs, so it’s very easy to take a tumble and lose your bearings. 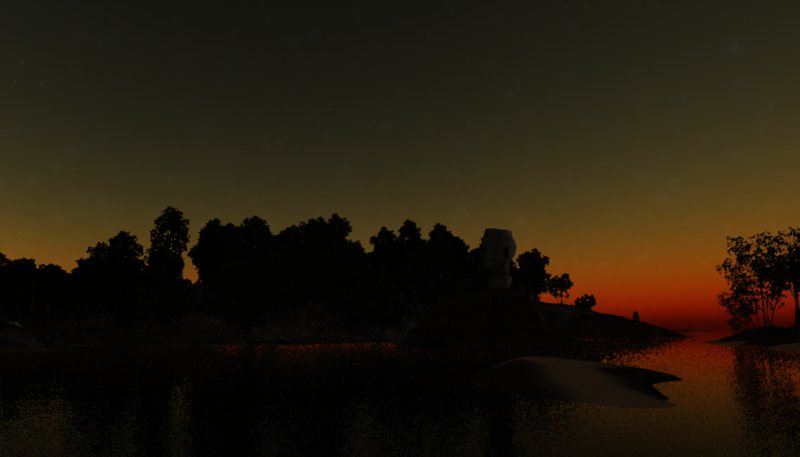 Miasmata’s island can be a rough place during the day, but at night things get worse, the almost total lack of light making navigation near impossible. Because of this, the evening’s warm glow acts as a warning shot. Do you know where you are? Do you know where the nearest safehouse is? Should you backtrack to safety or take the chance that you’ll discover a new safehouse in uncharted territory? If you choose to retreat, you’ll have to re-cover that same ground again the next day, but will have avoided potential danger. If you decide to continue exploring, you do so without guarantees. Everything could collapse if an encounter with the creature results in a chase in a direction you did not intend to go. Suddenly it’s darker than when you set out, not night yet, but searching the now blood red horizon for the silhouettes of landmarks becomes a bit of a guessing game with worsening odds. If you can’t find your way soon, you’ll be lost and in total darkness, and the beast may not be far behind. Miasmata’s evenings pit a number of opposing emotions against one another. Which side influences you more depends on your disposition and reaction to the unknowns that the game presents. Is fear or confidence dominant? The evening is a time of unease and imbalance without a singular, correct path. 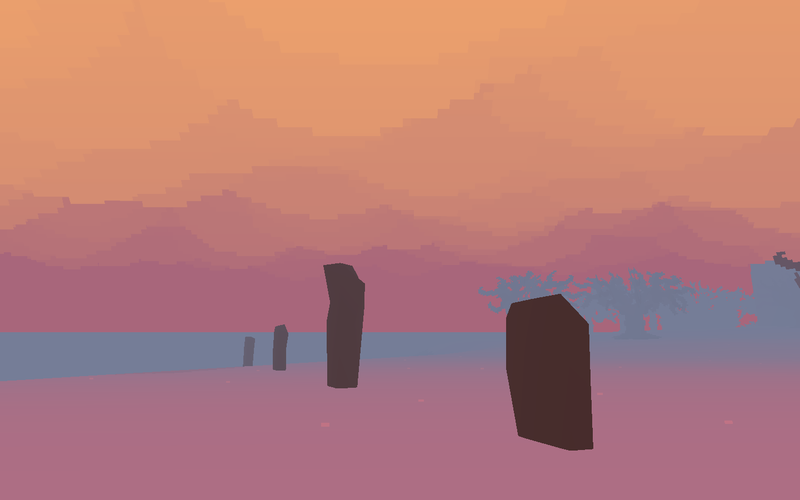 Proteus, while also set on an uninhabited island, lacks deadly creatures or danger of any kind. You simply walk around the island, observing trees and animals that generate whimsical music tones instead of the nature sounds you’d expect. 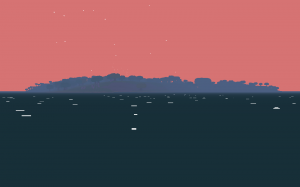 Despite the polygonal world, everything in Proteus is either flat-shaded or literally flat, and often painted in solid, vibrant colors or gradients. The mixture of sprites and 3D-modeled forms lends Proteus to an aesthetic that pleasantly evokes retro style, but also manages to feel fresh and much more than the sum of its parts. Since it’s such a beautiful, freeform game, I choose to play it as a photographer. Pressing the F9 key in Proteus takes a screenshot that also acts as a saved game file. You don’t have to take pictures as part of playing the game, but it’s where I’ve found considerable replay value. 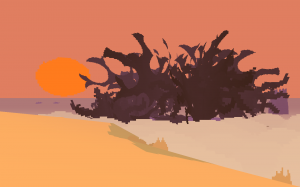 Being a nature photographer in Proteus isn’t dissimilar from being one in real life. After all, a nice photographic composition is a nice photographic composition, be the subject real or virtual. Proteus’ day/night cycle, weather patterns, and wildlife are all constantly on the move, requiring you to be quick on the shutter to catch the picture you want before the moving targets leave your frame. My favorite time to shoot, particularly landscape photography, is the evening. It’s a time of especially brilliant skies as colors morph between shades of orange, red and blue until night is in full swing. Time is of the essence as evening only lasts a few minutes by default. Perhaps I can manage to get a few snaps in as a rain cloud passes right through my line of sight of the sun on its way to fog over the island’s hilltops. Maybe I’d prefer to play with foreground and background and get close-ups of falling flower petals as the sun sets on the distant horizon. It’s really up to the strength of the player’s photographic eye as the possibilities are endless, but the time to shoot is quite limited. The limited time pushes me to shoot with focus and purpose. Proteus also provides a procedurally-mixed soundtrack that follows your photo safari from day into night. Even without visuals, the transition from day to night is apparent in the audio track, effectively acting as an audible timer for how long you have to gather your evening photographs. It’s not dancefloor material, but the mixing technique is the same long-form crossfade that follows the sun from high noon to the evening horizon. In both Proteus and Miasmata, evening may not be when canonically important events occur, but in the same way that I use transitions to distinguish myself as a DJ, it is the time when the games reveal their definitive character. In Miasmata, day and night act as poles of playability. Daytime is designed for player progress, revealing new areas for your map while searching for new species of flowers, all while carefully watching your step. Nighttime is designed for risk aversion to the point where it’s usually best to just sleep through it. Evening acts as a time of transition from offense to defense, frequently requiring the player to keep one foot in both camps until darkness finally overcomes the island. 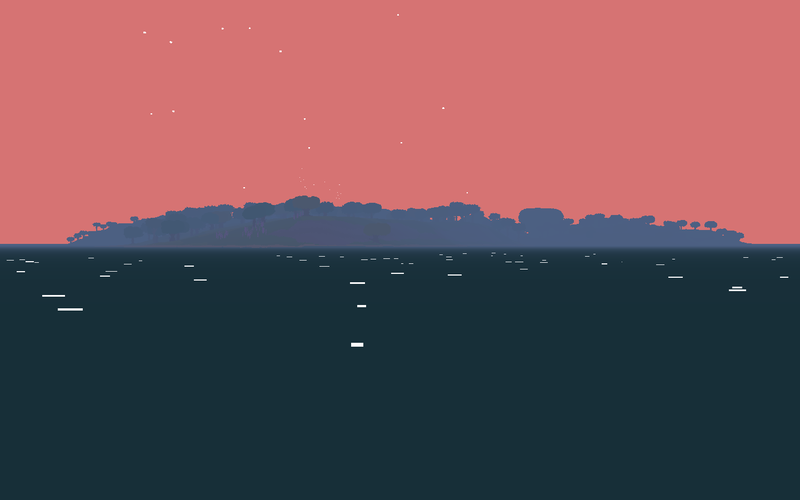 In Proteus, the day/night cycle is much more of a continuum. As such, evening is a literal mixture of light and dark, but also a consistent apex of photo-documentary potential. Transitions reveal authorial character in raw form. Transitions, be they cosmic cycles or musical crossfades, aren’t just representative of times of change. In Miasmata and Proteus, the evening shifts how you play. These are calculated design decisions that transition the world from one state to another, loosely guiding you toward particular activities. This elegant design avoids heavy-handed gameplay restrictions, presenting worlds that are fair because they’re upfront about their functionality. This is how game designers have adapted my ideal DJ mix into gameplay form. While the game designer and the DJ will always be the human minds behind these artistic statements, it’s the transitions themselves that do the talking, and that’s by design. Dan Solberg (@Dan_Solberg) is a visual artist, freelance writer, and occasional DJ from St. Louis, MO currently residing in Brooklyn, NY. He muses on art and games on Twitter and his personal blog Low Cutoff.